It is no secret that retroﬁts can pose some very unique issues for design teams. 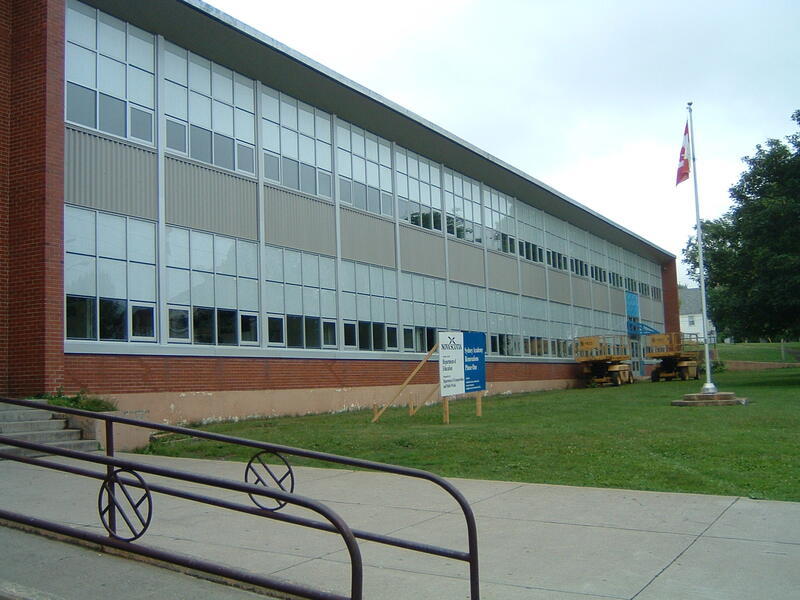 Sydney Academy, a high school serving some 800 students in Sydney, Nova Scotia, was originally built in 1959, using glass block as a major feature of the building envelope. The glass block, integrated with small vision glass units, worked well for daylighting purposes and was an excellent choice for a translucent glazing in its day. The glass block had deteriorated signiﬁcantly over 45 years. Direct replacement with new glass block was ruled out, as aesthetics and performance issues demanded consideration of other options more in keeping with the times. A review began of the various alternatives available. In order to avoid the problems of direct sunlight associated with vision glass, traditional daylighting strategies have employed complex architectural features to provide well distributed diﬀuse light to building interiors. However, their prohibitive complexity and cost have resulted in too few examples of excellent daylighting in schools. Translucent glazings oﬀer a better approach to daylighting. The diﬀused light from a translucent glazing penetrates deeper into the building interior, avoiding the contrast, glare and overheating problems associated with vision glass. Translucent glazings can be combined with vision glass to maintain view planes and are easily installed in standard punched window and curtain wall applications. In essence, they oﬀer high quality light without the architectural challenges of traditional daylighting. While non-glass translucents can perform reasonably well, they often do not meet aesthetic or performance objectives, such as shading coeﬃcient, sound attenuation, lifetime and ﬁre class. Nova Scotia Department of Education architects Don Lohnes and Charles Ritcey, consult with local school boards on their construction projects. They essentially act as a professional liaison, ﬁrst assisting school boards in deﬁning their needs and objectives, then working with the contracted architects to design a project that delivers to those performance expectations. Both are enthusiastic about the potential use of Solera in school retroﬁts. “Yes, there are deﬁnitely applications in existing schools,” says Ritcey, noting that Solera can provide a quality of daylighting better than glass block while oﬀering beneﬁts in terms of performance. According to Lohnes, Solera is a superior product when compared to glass block, as it can project daylight farther into the classroom. The additional energy beneﬁts of Solera are also an important product feature, in consideration of tight school operating budgets. As Solera is glass, it has the corresponding long life cycle, performance and visual appeal of glass. Dale Archibald, of Archibald & Jones, the project architects for the Sydney Academy retroﬁt, felt that Solera “made for a very slick solution to the technical problems that evolved with the building”. Solera T integrated into standard curtain wall, alongside vision glass. It was all easily installed, with no special considerations. The updated look of the school is very striking, with the aesthetic value of a glass-based glazing like Solera easily appreciated by any casual observer. The reﬂective character of the translucent glazing, paired with vision glass, is a highlight of the building. This compelling character will not deteriorate or diminish over time. It is glass. In addition to cost-savings in the installation phase, Solera provides budgetary beneﬁts across its entire life cycle. An energy analysis of the building showed that Solera had the potential to reduce energy costs by approximately 40%. The importance of this study was not lost on the client, who must eﬀectively manage a shrinking education budget.